As our Director of Design, Henrietta is wonderful with creating and finding solutions for beautiful, purposeful, liveable and workable spaces. She enjoys working directly with clients and mentoring younger designers. She has many awards including the Scrippps Art Foundation Award and appeared in the Who’s Who Among Students in American Colleges & Universities. Henrietta graduated from PCAD with the Pfaltzgraff Award for Highest GPA and the Outstanding Student in IED. Henrietta Heisler Interiors Inc. started in 2001 and has been consistently growing and expanding. 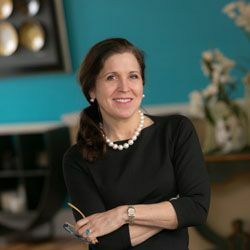 As a business owner she has received the MT Code of Excellence Award, GreenLeader for Sustainable Furnishing Council, a Feng Shui Certification and Kitchen and Bath Design Awards. Henrietta is flexible, very creative and she possesses a keen design eye, all necessary qualities in interior design as each project and client is unique and every job requires a different creative approach. She loves working as an interior designer because “living or working in a well-designed space makes people’s lives safer, happier, healthier and more productive.” Giving back to the community is also a big part of her life. She is Chairman of the Steering Committee for the Lancaster Public Libraries new Building and is on the Board of the YWCA. When not working or giving of her time to various charities, Henrietta loves to travel, collect art, literature, movies, and yoga.